Imagine waking up in the most beautiful setting after the most comfortable nights rest ever, to the sound of nothing but nature….the wind in the tree’s, the birds, and the creek gurgling just down the hillside…..at Davis Creek Cabin, we proudly offer a peaceful, retreat for a family friendly, dog friendly and environmentally friendly stay. Located in the peaceful Virginia woods, yet not far from so much! 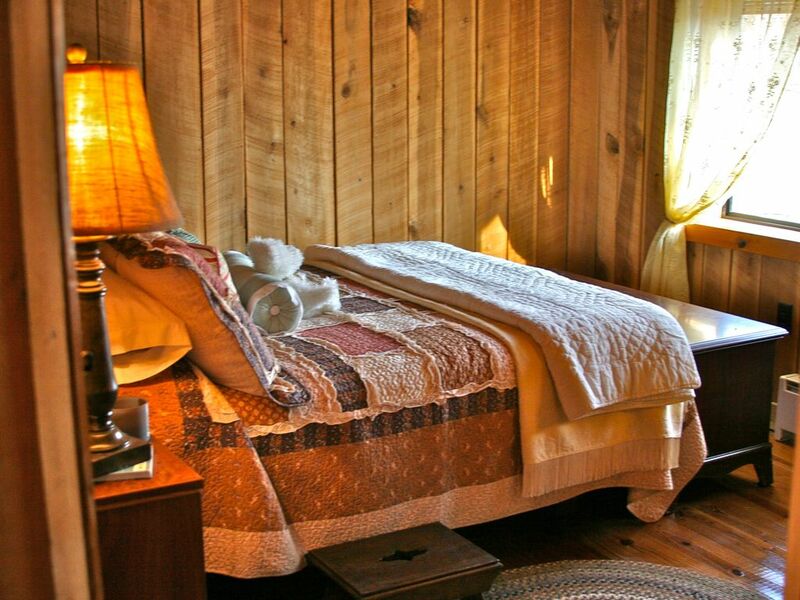 Davis Creek Cabin is a two bedroom, one bath with a tub as well as a shower. Our new Original Mattress Factory supreme mattresses will ensure you a great nights rest. We provide only the very best high count 100% cotton linens as well. There is a King size bed in the Master bedroom, and a Full size in the second bedroom. As well as an air mattress in the hall linen closet for extra’s. Plenty of bed space for up to 6 people. (if you have an extra kid, or Grandma wants to tag along, call us and we’ll discuss). In the Master bedroom there is an enclosed cabinet with a TV, DVD player, and a vast collection of movies. Both bedrooms and the loft are located on the second floor, up the winding staircase.